John Donahoe has a hammer, and he’s not afraid to use it. 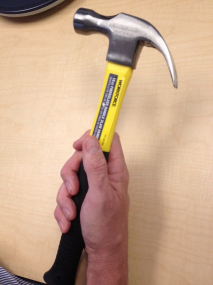 The yellow-handled hammer, which the eBay CEO purchased at Home Depot using PayPal, signals that the company’s plans for entering the mobile payments business has entered the construction phase. In an interview yesterday, Donahoe provided a few details about the company’s Home Depot trial and how it would expand from five to 51 stores across the country over the next week. The company also announced fourth-quarter results yesterday, solidly beating both the company’s internal guidance and analyst expectations. One of eBay’s big initiatives over the past year has been to find ways to work more closely with physical retailers by providing them with the technology they need to operate more efficiently online and offline. Over the past year, that has included buying 13 companies, for a total investment of $3.4 billion. One major opportunity is payments being made at the cash register, and arguably many others see it, too, including Google, Visa, MasterCard and the wireless carriers, which are all working on their own solutions. Interestingly, Donahoe was willing to put a price on it — and it’s huge. If eBay is able to capture just 2 percent of the sales occurring at the point of sale, it will be able to double PayPal’s $70 billion business today. If they capture 4 percent, they’ll triple it. Of course, that will take some time. This year, eBay is focused on learning and testing out the technology in several trials; then, in 2013, it will begin to scale the business. In 2012, the company is not even factoring in a lift from point of sales in eBay’s revenue guidance. The company’s big test will start later this week, when it expands its trial with Home Depot from five stores in the Bay Area to 51 stores in the Bay Area, Atlanta and Omaha. 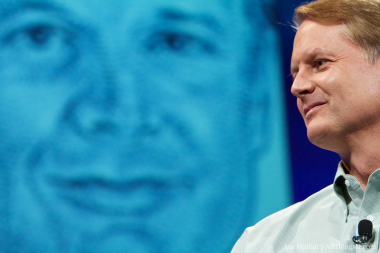 Everything continues to be on track, despite the unexpected departure of PayPal President Scott Thompson. Thompson shocked Donahoe right after the New Year with the announcement that he was leaving to become CEO of Yahoo. Donahoe declined to give an update on his plans to replace Thompson, saying that he was fine with serving the interim role in the meantime, and relying on the rest of the team PayPal has in place. So far, Donahoe said, the mobile payments technology works flawlessly, based on his own experiences, but there’s still some additional scenarios they will have to consider. Yesterday morning, he drove to a store in San Jose, where he consciously left his wallet and phone in the car. He walked through the aisles to find a hammer and tape measure, and then went to check out, where the terminal gave him the option of checking out with PayPal. He entered his mobile phone number and PIN, and the transaction was completed, with the receipts sent to his phone and email. Customers will also be given the option of paying with a PayPal credit card. But not all the pieces are in place yet. Coming soon: Users will be able to store their loyalty cards in their PayPal wallet, and will be able to receive personalized offers based on their shopping habits. Also, it’s worth noting that while Donahoe checked out easily, there will be a learning curve for others. In advance of going to the store, users will have to associate a phone number and PIN with their account, and enable their account for in-store checkout. Right now, there’s no contingency plans for if a person doesn’t have a PayPal account, or if it’s not set up. In fact, a very small percentage of the more than 100 million PayPal users have likely done that. “That’s exactly why I say this is the year for trialing and learning,” Donahoe said, appropriately adjourning the interview with a bang of the hammer.